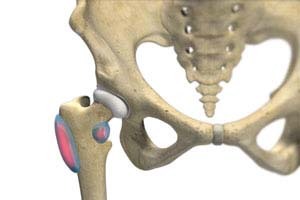 Hip bursitis is a painful condition caused by inflammation of a bursa in the hip. Bursae are fluid- filled sacs present in joints between bone and soft tissue to reduce friction and provide cushioning during movement. The bony prominence of the hip is called greater trochanter and is present on the outer side of the upper thighbone or femur. The bursa overlying it is called trochanteric bursa. Another bursa is located towards the groin region and is called iliopsoas bursa. Bursitis of the trochanteric bursa is more common than that of iliopsoas bursa. Treatment goals for bursitis are focused on resolving the inflammation and pain. Rest is advised and activities causing the bursitis pain are restricted. Anti-inflammatory medications are prescribed to reduce the inflammation and pain. Physiotherapy and treatments with heat, ice and ultrasound sometimes are recommended. An injection of corticosteroid medicine may be administered to reduce the inflammation. Sometimes, a second injection is necessary if the pain returns after a few months. These non-surgical treatments provide relief from hip bursitis in most cases.